Once the current inventory of CoachProxy units is sold out, I will not be building any new units. I anticipate running out of inventory within the next few weeks. All hardware warranties will continue to be fully supported. If you buy the very last CoachProxy, you’ll still have a full 1-year warranty from your date of purchase. 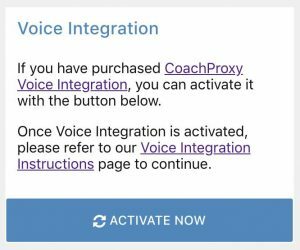 CoachProxy Voice Integration (Amazon Alexa support) has proven to be increasingly difficult to support as Amazon updates its devices and software. As such, sales of Voice Integration will end on February 22, 2019 (two weeks from today). Future CoachProxy software updates will be focused more on bug fixes rather than new features. The CoachProxy Remote Access service will continue to be maintained and supported, as many people (myself included) depend on this. I know how important CoachProxy is to many people. These changes will allow me to continue supporting existing customers without the difficulties of scaling the business and assisting new customers. 2/12/2019: CoachProxy is now sold out. 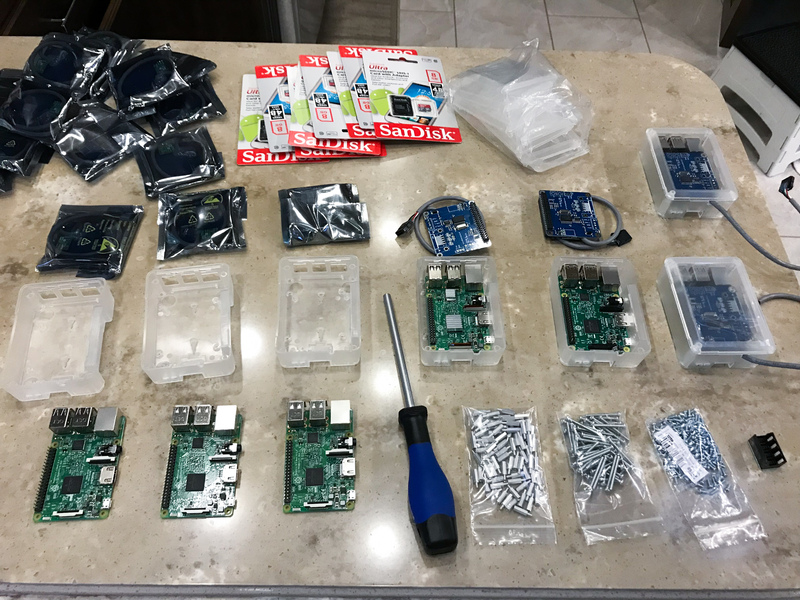 I’m pleased to announce a new update to CoachProxy’s hardware and software! Completely new WiFi networking software, to simplify configuration and reliability. A redesigned “read only” memory card configuration, to reduce the chances of the memory card image becoming corrupted. A significantly updated Linux operating system version. Also, all new CoachProxy units will include a hardware update as well — a second WiFi interface. 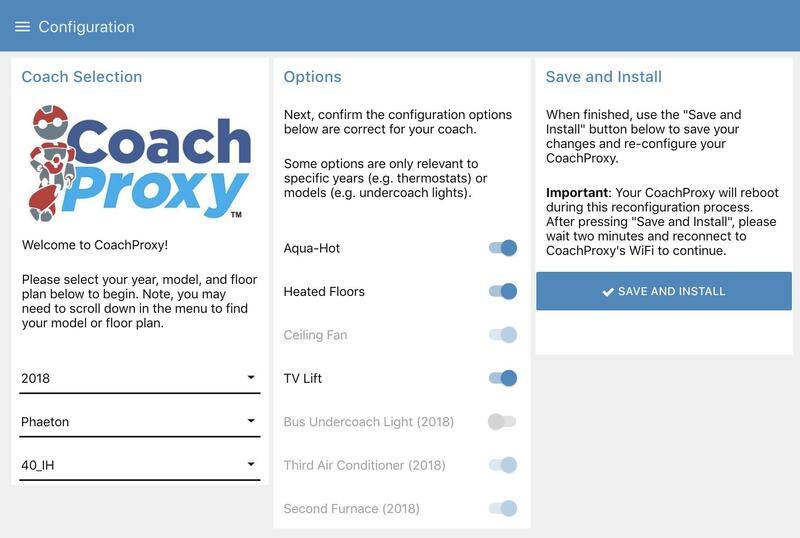 CoachProxy has always supported both a “Direct WiFi” connection as well as the ability to connect to your existing WiFi network. Previously, both of these WiFi connections were managed by CoachProxy’s single built-in WiFi hardware interface. By adding a second hardware WiFi interface, each of the network connections can now be operated on their own WiFi hardware. This greatly simplifies the CoachProxy WiFi management software, makes it easier and faster to change networks and passwords, and is expected to improve CoachProxy’s WiFi connection reliability. 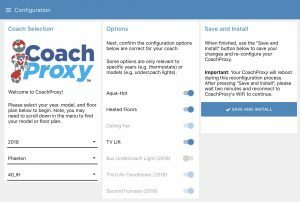 CoachProxy will begin shipping with the new WiFi hardware and CoachProxy 3.0 software in late November. 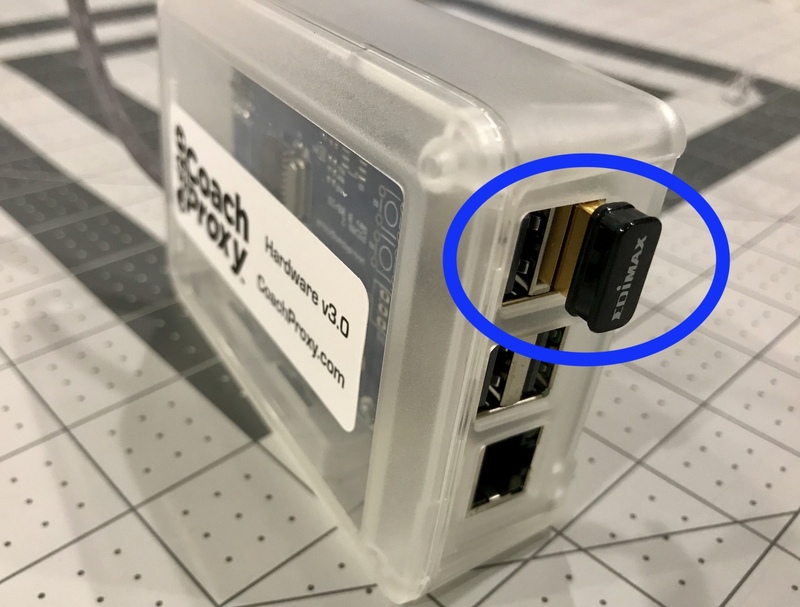 Note: you may notice that the label on your CoachProxy says “Hardware v3.0” — that reflects the internal hardware within the unit, and is completely separate from the software version. The fact that both are now v3.0 is purely coincidental. Please see our Change Log for details on the various software versions. We will send you the new WiFi interface completely free (shipped via Amazon.com). It easily plugs into a USB port on the side of your CoachProxy (see photo above). 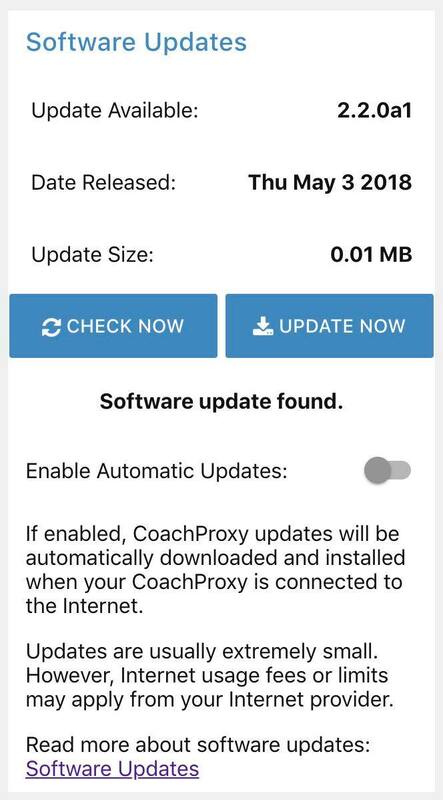 You will need to download the CoachProxy 3.0 software from our web site and install it on your CoachProxy’s memory card to complete the upgrade. If you prefer not to download and install the new software yourself, we can ship you the new WiFi interface, along with a new memory card pre-loaded with the CoachProxy 3.0 software. There is a $15 charge (plus shipping) for this service. Just plug the WiFi adapter into a CoachProxy USB port and replace your CoachProxy’s new memory card with the new one. If your CoachProxy is out of warranty (more than a year old), you can purchase the WiFi hardware upgrade directly from Amazon or other retailers for around $10 to $15. Purchase from Amazon at https://www.amazon.com/gp/product/B003MTTJOY (be sure “N150-Nano” is selected) or search the web for “Edimax EW-7811Un Nano Wi-Fi USB Adapter”. Just plug the WiFi adapter into a CoachProxy USB port. You will also need to download the CoachProxy 3.0 software from our web site and install it on your CoachProxy’s memory card to complete the upgrade. If you prefer not to download and install the new software yourself, we can ship you a new memory card pre-loaded with the CoachProxy 3.0 software. There is a $15 charge (plus shipping) for this service. Just plug the WiFi adapter into a CoachProxy USB port and insert the new memory card into CoachProxy. If you upgrade your CoachProxy to the new WiFi hardware, your home router/hotspot will detect it as a new device, and will assign it a new IP address. Any saved bookmarks, favorites, home screen icons, etc. will need to be updated to use the new IP address assigned by your router. Alternately, you may be able to reconfigure your router to assign your prior CoachProxy IP address to the upgraded CoachProxy device. This is especially important for Voice Integration customers. During the discovery process, your Alexa/Echo device memorizes CoachProxy’s IP address, and Amazon offers no interface to change that address once learned. You will need to use the Alexa app or web site to “forget” your devices, and re-run the discovery process with the upgraded CoachProxy. Please see Updating Alexa Voice Integration Device List for more details on this process. Note: if you recently updated your Alexa Voice Integration Device List with the instructions linked above, or if you were running CoachProxy version 2.3.0 or newer when you first set up voice integration, and if you can reconfigure your router to assign your prior CoachProxy IP address to the upgraded CoachProxy, you should not need to forget and re-learn your Alexa devices. If you are happy with your current CoachProxy hardware and software, there’s no need to upgrade to CoachProxy 3.0. Software version 2.x (currently at version 2.3.3) will continue to receive periodic bug fix updates. However, any new features and support for new coaches will only be released for CoachProxy 3.0. Unfortunately the two software versions are different enough that developing new features for both is not feasible. Beginning with orders placed on January 1, 2019, CoachProxy’s price will increase from $399.95 to $449.95. This change is being made to reflect the increasing costs of CoachProxy parts, the addition of the new WiFi interface hardware, and the ongoing investment in developing new features. So much has happened since our last news update in late February, it’s hard to decide where to begin! Most importantly, we caught up on the wait list and have built plenty of extra inventory to handle new orders. Whew! With that out of the way, a great deal of time and effort has been put into improving the underlying CoachProxy software to make future features easier to develop and deliver. On April 1 (no fooling!) CoachProxy software version 2.1 was released. This was a major update that added a new self configuration system into CoachProxy. 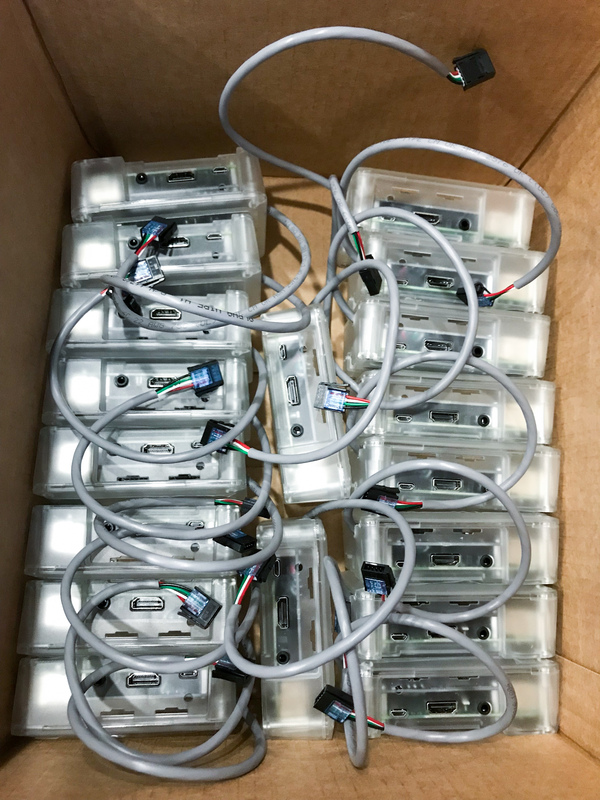 Previously, each ordered CoachProxy needed to be manually configured before shipping, to add the correct lights, features, and options for the customer’s coach. This was a time-consuming and error-prone process, and once configured, that CoachProxy would only work on the coach it was built for. With the new self-configuration system, all CoachProxy units are shipped with the same software, and the customer selects their year, model, floor plan, and options the first time CoachProxy is turned on. CoachProxy rebuilds its software configuration and in a few seconds is ready to go! Best of all, when moving CoachProxy to a new coach, a customer just updates the year, model, and floor plan to reconfigure CoachProxy for their new rig. There were of course several other improvements along the way: Aqua-Hot engine pre-heat control and door awning control for 2018 coaches, a bar chart visually showing tank levels, support for 2018 RED, Breeze, and Open Road thermostats, additional lighting controls for the 2018 Bus, and a sprinkling of bug fixes. On May 8, version 2.2 was released. Another major update, it includes a new automatic software update system. Once version 2.2 is installed, future software updates can be easily and quickly installed as soon as they are released! Software updates are tiny in size (usually less than 1 MB), but customers with limited Internet bandwidth can choose to turn off automatic updates and perform updates manually with the click of a button. Since older versions of CoachProxy don’t include any kind of software update functionality, users wishing to upgrade to version 2.2 will need to do so manually. This requires removing CoachProxy’s memory card, downloading a 600 MB file on a computer, and installing the file onto CoachProxy’s memory card. Full instructions are available at Re-Installing CoachProxy Software Image for those who are interested. We recommend using a spare microSD card the first time, so that you can re-install your original CoachProxy memory card if something goes wrong with the install process. Once you are satisfied with the new software, you can install it onto your normal CoachProxy memory card. For those who want to upgrade to Version 2.2 but don’t want to download and install the new software manually, we can ship you a new memory card with the latest software pre-installed, for $14.95. Of course, if you are happy with your current CoachProxy software, there’s no need to upgrade! Your current software should continue working indefinitely. As usual, there were also a few smaller improvements and fixes included in version 2.2, such as motorized windshield shade controls for the 2018 Phaeton. You can learn about the changes included in each new version on our Change Log page (always available in the “About CoachProxy” menu at the top of our web site). Today, May 17th, software version 2.2.1 re-introduces support for Amazon’s “Alexa” voice integration add-on! If you have been waiting to purchase this feature, please review our new Alexa Voice Integration Instructions page to be sure you understand the networking requirements and supported features. 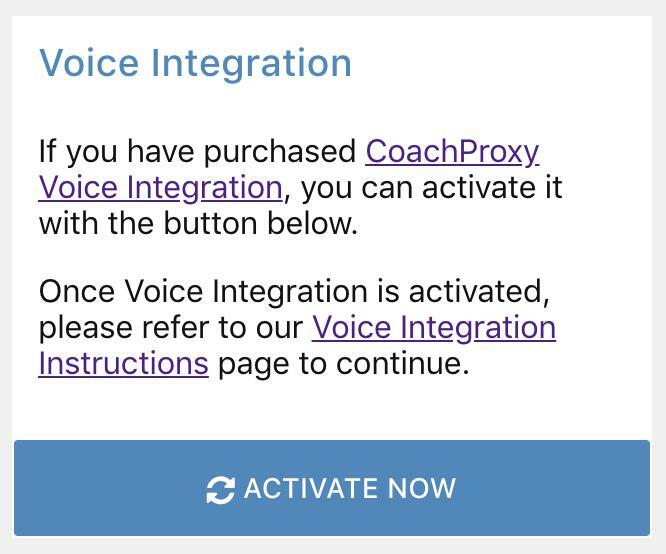 After you have upgraded your CoachProxy software to version 2.2.1 and configured your CoachProxy with a static IP address, you can purchase the Voice Integration add-on from our store and activate it immediately. If you experience any difficulties, please contact us and we’ll try to help. Version 2.2.1 also includes a complete re-write of CoachProxy’s window shade and door awning controls. Most of these changes should be invisible to users, but do contact us if anything isn’t working as expected. The most visible change is for the 2018 Allegro Bus: grouping related shades together (e.g. “Cockpit Shades” vs. “Main Shades”) and new controls to raise or lower the shades in each of those groups. So what’s coming up next? Check out our Roadmap page to get a sneak-preview of what else is in store! That’s a great attention-getting headline, but before I get to “the good stuff”, I have to take a moment to tip my hat to the amazing work Michael Kidd has done in creating CoachProxy, and in helping me get up to speed on the hardware, software, and business aspects of the project. His #1 goal has been to ensure that CoachProxy lives on and continues to be available to motorhome owners at a reasonable price. We both view CoachProxy as filling a surprising technology gap that still exists from Tiffin and other manufacturers, and I’m thrilled to have the opportunity to continue serving CoachProxy customers going forward. I’m excited to report that last week we resumed CoachProxy shipments to customers on our wait list! There are quite a few people on the wait list dating back to October 2017, so to ensure fairness we’ve been contacting people in the order that they joined the wait list. We have enough CoachProxy units built right now to catch up on October, November, and some December wait list customers. 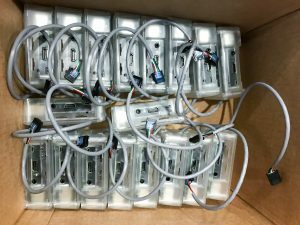 But don’t worry, we have a big new shipment of parts arriving in less than two weeks that will enable us to build enough units to satisfy everyone on the wait list, and have units to spare! Working the CoachProxy assembly line in our 2018 Phaeton. Completed CoachProxy units awaiting orders. 2018 thermostat controls. Click to view a brief demonstration. As Michael discussed in his previous news update, there are some big changes in CoachProxy 2.0, including support for some new 2018 Tiffin features. One of the most long-awaited improvements arrived in 2018 coaches: Tiffin has replaced the clunky old RVComfort thermostats with all-digital, Spyder controlled thermostats! It wasn’t long before we had CoachProxy controlling nearly all the features of the HVAC system. It’s now possible to choose heat/cool mode, heat pump vs. furnace, fan mode, and each temperature set point. Yes, you can now turn on your air conditioner and monitor your indoor temperature remotely, if you have a 2018 Tiffin and CoachProxy’s Remote Access service! Another great addition to the Spyder network in 2018 is the Surge Guard Automatic Transfer Switch, or ATS. This now enables CoachProxy to monitor shore power voltage, real-time amps used on each 120V leg, and detection of shore power loss. In addition to displaying this information on your screen, we’ve added the ability to send e-mail notifications when your coach loses shore power! Unfortunately, Tiffin only included ATS monitoring on the Phaeton, Bus, and Zephyr, so other 2018 coaches will not be able to monitor shore power. Speaking of changes, we have a brand new page on our CoachProxy web site: the Change Log. We’ll update this page as we make changes to CoachProxy software, so you’ll always know what’s new and improved. Right now our top priority is catching up on builds and orders so we can clear out our wait list and get CoachProxy into the hands of those who have been patiently waiting for months. Since a lot has changed “under the hood” in CoachProxy 2.0, we’re also trying to get it tested on as many coach configurations as possible. Each year and model of Tiffin requires slightly different software to interface with the Spyder Controls system, making testing quite a challenge since we only own one coach–our 2018 Phaeton! We now have CoachProxy 2.0 installed on the 2015–2018 Allegro Bus, 2017–2018 Phaeton, and 2015 and 2018 Allegro RED, and have had to make a few changes based on feedback from those customers. Fortunately, Kathie and I will be visiting Red Bay in April for our 6-month repair visit and I’ll be collecting data from every rig I can find, including the Wayfarer if I spot one. As always, if you have questions or problems, don’t hesitate to use our Contact Us page to get in touch. We’re using a new customer ticket system now as well, so if you try replying to an old CoachProxy support ticket (one from a “@kiddbott.com” address), it won’t work any more. Can’t get enough CoachProxy news? 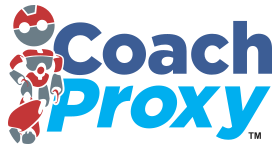 You can also join our CoachProxy Facebook group to get more frequent, more casual updates, and to chat with other CoachProxy customers. Until next time, thanks for your support, and safe travels!